Papers are KI Memories, the big letters are Cardstock Letter Stickers by s.e.i., Heidi Swapp's ghost letters attached with Making Memories brads, Ribbon Sliders from Pebbles Inc., and some ribbons from my Ribbons Galore. 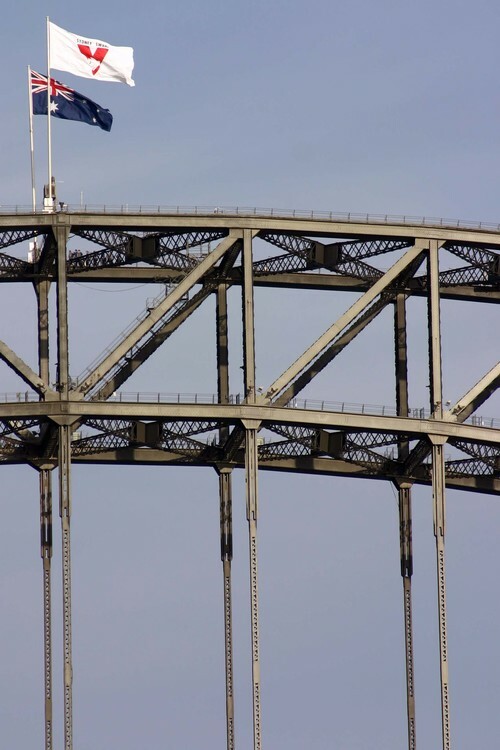 The Sydney Swans won the Grand Final last weekend, and their flag is now proudly flapping a top of the Sydney Harbour Bridge! I'm not sure how long it will be there, but it sure is a great sight!! I took the girls down to see it this afternoon. 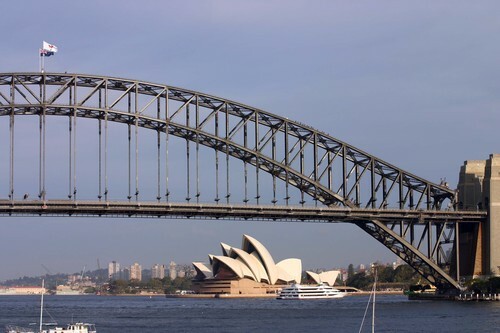 We had a lovely afternoon wandering around the northern foreshore of Sydney Harbour. We really are lucky to live so close to this beautiful city and harbour! Have I mentioned before I take waaayyy too many photos? With all these photos, there are a handful that really do become my favourites. I have favourite photos of my girls at different stages of their life, photos that just capture them at that particular point of their life. 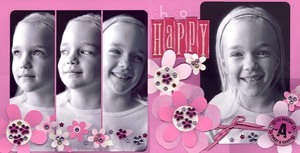 A layout using some of my favourite photos of Phoebe from last year was in the latest Scrapbooking Memories. These photos were taken on our front veranda, which despite facing south, has lovely lighting, and is quite often the spot I pick to take photos of the girls - they sit there, sometimes being silly, sometimes smiling nicely for me. I just sit on the veranda with them, chatting and snapping, and hopefully capture a little of them! 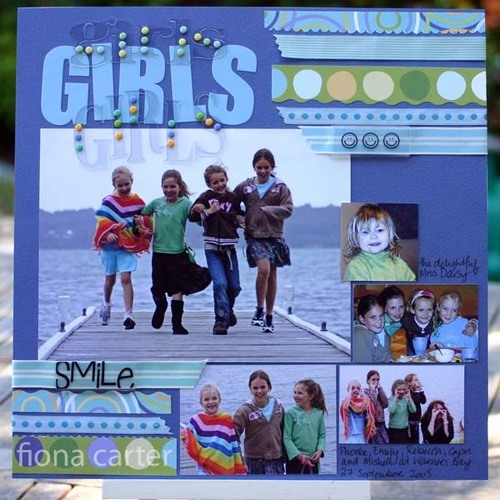 I'm a big fan of Kindy Glitz by Derivan, but have never used it on a scrapbooking layout. That changed with this layout. To add to the glitzy theme, I filled Making Memories jigsaw alphabets with Kindy Glitz. After painting the alphabets and mounting them onto some backing cardstock, and fill the letters with Kindy Glitz. It will take a while to dry thoroughly, so leave plenty of time. A little coaster from Li'l Davis Designs went well with the theme of the layout. A few mini flower jewels were added with mini glue dots. The large flower here is cut from polypropylene plastic sheeting, and painted with pink acrylic paint. A large circle was used for the flower centres. A spiral was stitched onto the circle, then finished with flower jewel attached with glue dots and more s.e.i. Rhinestone Brads. More detail on another flower. Ribbon! Just because, I guess, you don't need an excuse to pop a little ribbon detail on a layout! I thought it would be fun to show a little behind the scenes occasionally - basically what really goes on behind a layout. Now, I'm the first to admit I take WAY TOO MANY photos of everything. Especially now with digital cameras, I just keep snapping away. And they all end up on the computer. I hate deleting any digital photo I have on file. While going through my photos recently, I went through the folder containing photos used on a recent layout of mine in the latest Scrapbooking Memories... Almost Spring. I counted them, I took 35 photos of this short little time in our garden one afternoon. AND I only used four of them on the layout. Admittedly Phoebe had been sick for days before these photos, and really didn't want to be stalked by her mother around our front garden, when all she wanted to do was pick a few flowers for her bedroom!! I was very persistant, I sat and waited, I snapped, and kept snapping, no matter what look Phoebe dished up to me trying to tell me to "GO AWAY & LEAVE ME ALONE", I stayed and snapped some more! Here's a little selection of the many photos that didn't make it onto this layout. I do love these photos, they are classic Phoebe expressions, and although they didn't make it onto a layout this time, they may come in handy for another day. Phoebe is very patient ... if it was Emily I was photographing she'd have been long gone! !